“Spider-Man, Spider-Man, corporate, global Spider-Man…” It doesn’t have the same catchy appeal as the friendly, neighbourhood original does it? However, while the song doesn’t remain the same and loses a little of its soul in its suit and tie executive make-over, Worldwide doesn’t miss a beat, lose a step or put a foot wrong from beginning to end. 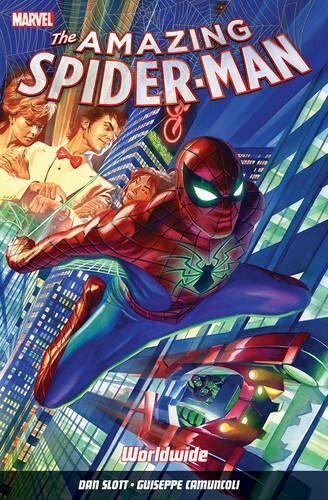 Sure, Pete’s life may have changed beyond all recognition now that he’s the head of a major, multi-national company, but he’s still Spidey, and in the wall-crawlers world, the more things change, the more they stay the same. He’s still caught up in an endless web (groan, the puns, they just get worse) of battling super-villains and trying to juggle his personal and professional lives, but now he has to do it on a much grander scale. Because with greater power comes greater responsibility and now his secret identity is nearly as rich and powerful as that other incredibly famous and entirely fictitious entity, God. But he’s still nowhere near as wealthy or influential as Tony Stark, a fact that doesn’t go unnoticed in, and is referred to throughout, Worldwide; and Spider-Man acting as Peter Parker’s body-guard not only helps to reinforce it, but also serves as touching ode to the “Golden Age” of Iron Man and Marvel. Tagged Amazing Spider-Man, Dan Slott, Guiseppe Camuncoli, Panini, Peter Parker, S.H.I.E.L.D.